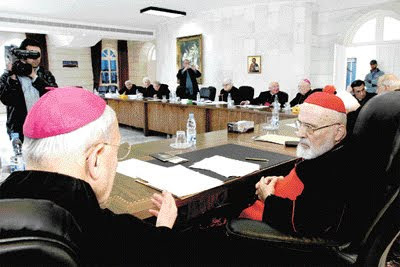 The meeting of the synod of Maronite bishops, who have been convening in isolation from the outside world since Wednesday, has been shrouded in secrecy in an indication of a close race among favorite candidates, [a] source said. The source added that the failure to quickly settle the outcome of the electoral race within the coming two days would most likely prolong the process further while favorite candidates would lose the advantage to bishops regarded as compromise figures. The conclave’s first electoral rounds kicked off Saturday morning after three days of prayers. Four rounds have taken place daily since Saturday: two in the morning and two in the afternoon. The failure to elect a new patriarch within a 15-day period would require the Vatican to intervene to appoint one. “That is why bishops will agree to drop support to favorite candidates after their failure to obtain a two-thirds majority and agree to grant their votes to a compromise candidate to avoid the intervention of the Vatican to resolve the deadlock,” the source said. The source said the major complication hindering the victory of a candidate by a two-thirds majority was the adoption of an open vote system, which bishops thoroughly debated Saturday when they decided on rules governing the vote process. When Sfeir was elected in 1986 to succeed late Patriarch Antoine Khreich, he, like his predecessor, was elected as a compromise candidate after then favorites failed to guarantee a two-thirds majority. “If the bishops fail to elect a patriarch within the coming two days, any nominations will be mere speculations because the election of any candidate becomes possible,” the source said. If the newly elected patriarch is not a bishop, the result of the vote will be kept secret, even from the elected cleric until he is notified of a decision to elevate him to the rank of bishop before he is declared patriarch following Vatican approval. The elected cleric must accept the post within two days or else his election will be deemed void. Upon his election, every new Eastern patriarch's first act is to formally petition ecclesial communion with the Pope of Rome, to which the pontiff quickly assents before the choice's enthronement by the hierarchy of the respective sui iuris (self-governing) church.